Dano, Just cut and pasted your post in another realm of my social network. I applaud you for your efforts, and hope this ends up as a life saving reality check for all divers that read it. I hope it is OK to bump this thread and to remind everyone about our weight belt policy. 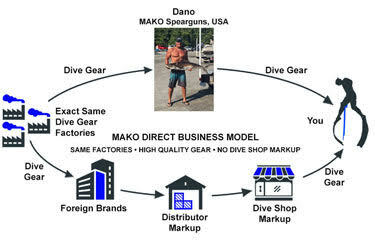 MAKO Spearguns recognizes that diving (both freediving and SCUBA) are potentially dangerous activities. We have all heard of tragic accidents where a diver is found on the bottom while still wearing a weight belt. We hope and pray that should any of our customers find themselves in a situation where ditching a belt may be necessary, that there is no delay and the belt is dropped immediately. In many situations a belt is recoverable, however if your MAKO belt and lead and/or Tinman weights are ditched (and lost) in a true emergency…. MAKO will replace them at our cost. so has anyone taken you up on this yet? I have always told my kids the same thing. Got a problem and need to drop the weight then do so and I'll gladly replace it with whatever one you want. Yes we have provided a replacement in the past. Thanks! Also, I see that we added this video about rubber weight belts to our website after we announced the replacement policy. Once again, MAKO is a real leader in customer service! Yep, good job MAKO. That's a great policy. I thought it would make sense to provide a link between the MAKO Weightbelt Policy Thread and a more current report. wow, very nice of Mako. Are there going to be any Black Friday deals?